Sunscreens come in two flavors: physical and chemical blockers. Physical sunblocks (also known as mineral sunblocks) contain zinc oxide and/or titanium dioxide. These ingredients sit on the skin and reflect the sun’s rays. Zinc oxide is superior to titanium dioxide, so be sure to look for one higher in zinc oxide content. In contrast, chemical sunscreens are absorbed by the skin and absorb UV rays. For babies, under six months of age, it is best to avoid chemical sunscreen as babies have higher systemic absorption compared to older kids and adults. Because babies do not have the fully-developed heat regulatory abilities of older kids, it’s ideal to keep them indoors or entirely shaded, as prolonged exposure to heat is not well tolerated. 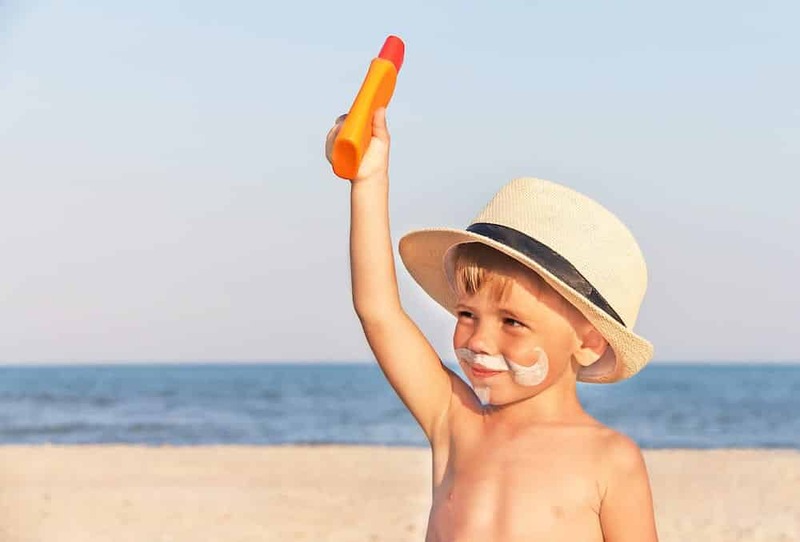 However, a small amount of mineral sunblock is safe if there is no way to avoid the sun (after all, zinc oxide is the same ingredient in diaper paste!). Keeping babies in sun-protective clothing is most important at this age. After six months of age, physical sunblocks are ideal as they work immediately when applied to the skin and are not systemically absorbed. As your babies grow, certain chemical sunscreens are good options as they may offer excellent broad-spectrum coverage to both UVA and UVB rays. However, a word of caution: most chemical sunscreens sold in the USA do NOT have good UVA coverage. The best chemical sunscreens contain Mexoryl or Tinosorb and can be found readily outside the US. Please discuss this with one of our doctors or nurses if you would like more information on these products to keep your babies sun-safe. We have a selection of chemical-free sunscreens for sale in our office. Most important is that babies are kept covered with hats, sunglasses and sun protective clothing!